If you are thinking about signing up for any of our classes, please contact us and schedule a time to visit. This first class is completely free, and with Shifu’s permission you may participate in the class or watch from the sidelines. 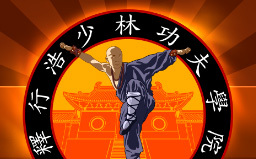 Try our Kung Fu, Tai Chi, or Lion Dance classes - or try all three! Please bow towards the instructor as you enter the training hall, in the customary Shaolin way. 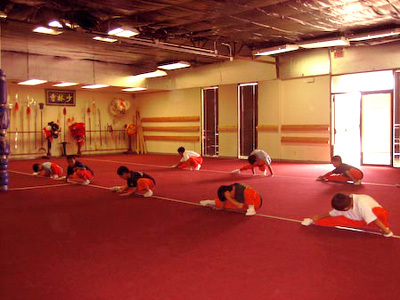 If you do not see the instructor, bow towards the middle of the room and enter anyway. If you’re unfamiliar with the correct protocol, you may ask an instructor for clarification. Unlike most martial arts schools and gyms, there is no obligatory contract at our academy. Tuition is due at the beginning of the month, and is good for the entire month. Different tuition prices are available depending on the type of classes you wish to take and also how often you wish to come. For specific price information, please contact us. Please wear the full uniform at each class. The instructor on duty needs to know what level you are or whether or not you are enrolled. It is also a sign of respect to the school and to the teacher to show up in full uniform normally. If you need to buy an additional piece, please request to order it from the teacher in advance. He may or may not have the right size item in stock. Weapons Training does not normally begin until midway through the 2nd Level. When it does becomes appropriate for a new student to learn, the teacher will advise you on how to train and will ask you to purchase your own weapon to practice with at home in addition to in-class training. If you are not currently being taught a weapon by Shifu, please do not bring one to class. No weapon should ever be brought to class, with the exception of weapons you have been taught by Shifu himself. Knowing the tenets are usually enough, but it is worth saying that no brawls, angry tirades, or dangerous/disruptive showing off will be tolerated. Follow the instructor’s directions and work on what he gives you. Have respect for the training hall at all times. Friendly cooperation and fun are the most important things. And last but not least -DO NOT TEACH OTHER STUDENTS unless the Shifu has asked you specifically to do so. Teaching is the master's role and it is up to him to decide who should learn what, when, and from whom. Same level students may share or work together on their own forms, etc., but for more advanced or subtle matters it is always best to seek the master's input, so always ask him first.